My search for a better tone over the years lead me to DIY effects. The possibility of customizing my effects lineup to my liking was just too sweet to not do. I now have way too many pedals. 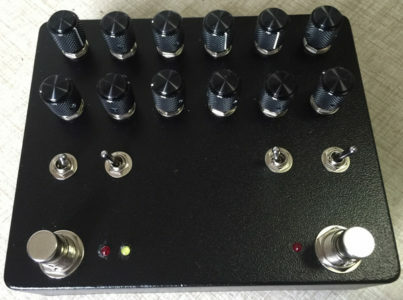 As is true for many DIYers, I got addicted to making pedals, and it seems like I can't help but build another compressor, reverb or delay, along with a lot of other types. I'm not that knowledgeable about circuit design, but I manage to build well enough for my own use. I recently built this pedal, a pretty exact copy of the preamp from a 1970's Lab Series L-5 amp. I used to have one of those back in the day, and was intrigued to say the least when this project when this project became available. 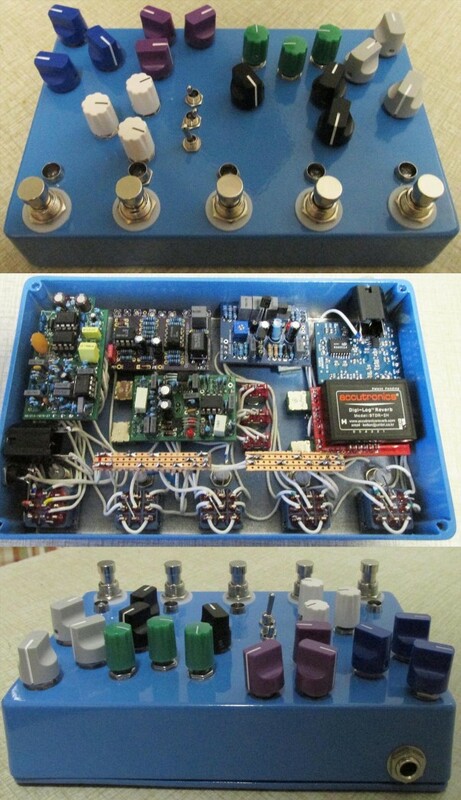 It's a board by Aion Electronics, and he did a fantastic job in all respects! Despite the large parts count and the specificity of voltages for some of the passives, it was pretty much a breeze. I definitely took my time and double checked every part before soldering cuz I didn't want any part of having to troubleshoot this one! 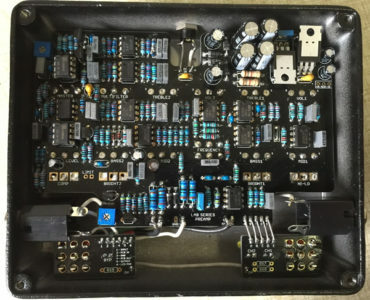 The Lab Series has two channels, a Fenderish A channel with Treble Mid Bass Bright and the B channel, which has the thing I always loved about the Lab Series amp—the parametric midrange controls (this channel also has a comb filter for even more tweakability). There's a built-in compressor/limiter with a fixed ration that completes the sound. The para/mid control made it really easy to dial in a good sound no matter what type of music I was playing. It definitely was not as "shimmery" as a true tube amp, but for jazz, it really excelled. This pedal version is no exception, and I have been running it into the front of my Mesa Subway Blues to good effect. Along with my new mahogany/humbucker tele, I am digging the sound for jazz on the B channel with the compressor on alot. I should probably add some labels to the controls at some point, but for now, I can keep track pretty well. I use the klone to beef up the midrange content of my "country" Tele: the gain control adds midrange, which is the key to getting a jazzier sound Also the tone control both boosts and cuts treble content, so there is wide range of possibilities with this circuit. Some folks use these as overdrive pedals, and it will definitely do that, but for me it's an overall tone shaper. The compressor also acts as a limiter. I use it to create a sense of sustain and help even out volume. The tube screamer is for overdrive sounds and has several clipping options and EQ settings. The tremolo is based on an EA Trem. The delay is a Deep Blue Delay.